Product #2769 | SKU SAGM1U | 0.0 (no ratings yet) Thanks for your rating! 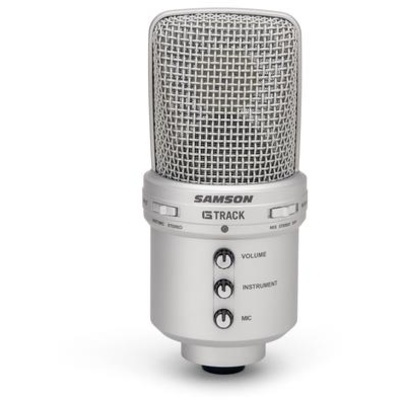 The Samson G-Track is a unique USB recording microphone designed to help singers, songwriters, musicians and Podcasters capture those sudden moments of inspiration quickly, efficiently and with minimal setup. The G-Track features a high-speed USB port for direct connection to any computer without additional audio cards, interfaces, etc. The USB bus-powered microphone requires no additional batteries or external phantom power for complete plug-and-play operation. The G-Track is also an analog interface with a stereo 1/8" (3.5mm) mini connection for mono or stereo instruments, and line devices such as MP3 players. A second 1/8" mini output connection provides latency-free headphone monitoring. Three dials provide individual control over instrument, microphone and headphone level, providing everything needed for quality recording on-the-go. The G-Track features a high-speed USB port for direct integration with desktop and laptop computers. The bus-powered microphone requires no batteries or external phantom power source. A 1/8" stereo mini input will connect instruments and line devices such as MP3 players. A direct headphone monitor output is provided for latency-free monitoring over audio inputs, computer and microphone audio. Three dials provide individual level control over computer level, instrument and microphone level.